Whether it’s wedding music or a live performance for a corporate event, you can bet that RythmTrail will provide your party with the spark and upbeat swing that only a steel drum band can offer. Playing the best calypso, reggae, soca and steel drum music for over 20 years, RythmTrail can make sure you and your guests get an unforgettable event that will take you far from Alabama and whisk you away to the Caribbean islands. Just a a click or phone call away RythmTrail will give you the best bang for your buck. RythmTrail steel drum band can provide your event, gathering or party with the rocking Caribbean sounds of a full-on steel drum band or offer a more cost effective simple solo performance that is sure to suit your party’s theme and budget perfectly. 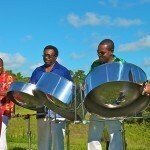 Our native Caribbean island steel drum players will ensure your gatherings musical needs will be fulfilled by some of the top steel drum players in the area. RythmTrail can not only play any wedding in Alabama, but we can also play corporate gatherings, house parties and any event all over the entire state of Alabama, nationwide and even internationally. This way, you can be sure you’re going to get the top ceremony music for your special day or best band for your corporate soiree whenever and wherever you need us. We can even play your own playlist of songs and favorite tunes for the perfect party music. Or let RythmTrail do the work for you and enhance your gathering with romantic, upbeat or even suspenseful music that will suit whatever theme you’re looking for. So what are you waiting for? Call RythmTrail right now at 866-495-4522 or get your free quote online and take your next event, party or gathering on a tropical island adventure. Jammin in Fairhope Alabama tonight at Eastern Shore Art Center for a surprise 60th birthday party.The best steel drum players in Alabama.